An Egret wades through the knee-high water outside of The Mad Hatter restaurant on Sanibel Island on Tuesday afternoon. 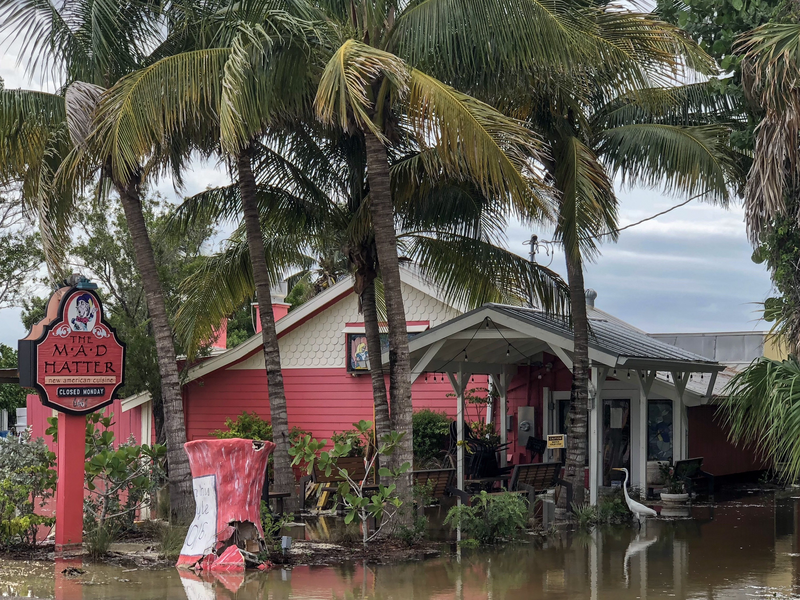 As winds from passing Hurricane Michael pushed tides higher on Florida’s Gulf Coast, floodwaters rose in some parts of Southwest Florida. 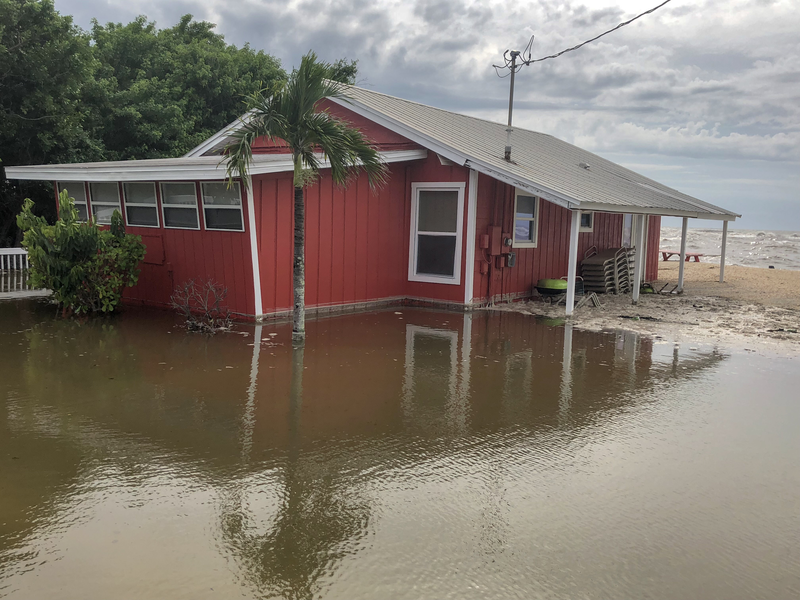 The colorful bungalows on the edge of Sanibel Island – just before it becomes Captiva – were filling with water on Tuesday afternoon. Nearby stood The Mad Hatter, now surrounded with debris-filled water. Kurt Jarvis co-owns the restaurant with his wife, Michelle. This wasn’t the first time this had happened though. This time last year, the tides also rose around The Mad Hatter. This time, some water got in through the entrance, and what used to be the parking lot now resembled a wading pool. So, the reservations for the night were cancelled, and Jarvis went back to loading more sand bags at the front door. Past the bungalows, at one of the entrances to Blind Pass Beach, Millard Everhart stood with his bike resting against his hip, as he watched the waves crash a few feet away from the road. 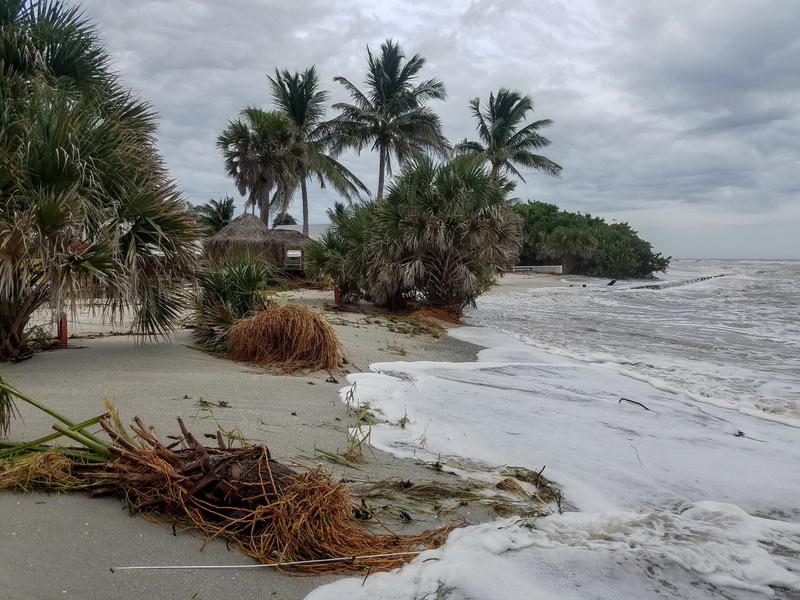 “My wife, today, sent me this picture of water near the Castaways I believe, just down the road," Everhart said, outstretching his phone. The former judge’s wife got the photo from Facebook. The couple spend most of the year here at their home just two miles south of the flooded area. Like many Sanibel residents, Everhart’s brush with the waves was the closest the water got to him on Tuesday. On this narrow island, the difference of not even blocks but, sometimes, just yards can be what decides whether the waters rise around or inside a home.